Hawks in Backyards — Are they being driven there? It seems there are two Coopers Hawks in our back yard. This has driven most of the small birds away from our feeders. I guess the Hawks will leave once they see that there aren’t many birds for them to prey on. A friend in town also tells of two hawks in his back yard. I wonder if these hawks are here because they are young and stupid (unafraid of people) or is their natural habitat being destroyed, driving them to our backyards. I’d like to know what you think. Photos on this blog are copyright protected. Therefore, if you wish to use photos please make a donation in an amount of your choice. My PayPal email address is fwinters@verizon.net. Kleptography – Don Ellis’ great images made with P&S cameras. Laurie G. Miller's Painting Patter: "The trials and tribulations of creating art"
Marc Adamus A young and brillant landscape photographer. My Daughter Aida Jones’ Paintings. Such an amazing shot of this hawk! It is always fun having them around in the back yard! Thanks Monarch! Do you see hawks in your back yard? Tell me about them if you do…. This is way out of place. Sorry. But it’s been a while since I’ve been able to check your blog. In the process today, I noticed a couple pictures of your tent set up to sell your work. I also have a tent I use for our area festivals. I noticed in yours that you use barbell weights to weigh down the corners. I just got the same for mine, so it was interesting to see someone else doing the same thing. But I hang mine from the top. It looked as if you connected your weights to the poles. Could you explain just where and how you do that? It looks like yours would work better than the way I have mine set up. wow. it’s so sad that we are destroying so many natural habitats. People keep coming to this blog entry — and another one with a hawk. I guess people like hawks? I can imagine that my photo looks like you grandfather — it was shot with not great lighting at a not great angle with branches in the way. I’m surprised it even looks a little like a hawk! Many thanks for your expression of love for my photo — enjoy it on your computer! I also have had a hawk in my yard, especially around my feeder. I live across from conservation land so I figured that was why it was here. I’m not sure mine was the same type of hawk; I’ve been trying to figure that out. Actually, that’s how I came across your pic to begin with. I think mine might have been a red-shouldered or red-tailed hawk? I watch hawks all the time and they stop to rest in peaceful place’s .I have a lot of indain firends that have taught many things. Thanks so much for your insight, Charles Nathan Dickens. I’m so glad I found your blog! I was looking up hawks this morning. I have two in my backyard that look very much like your picture. I was opening a window, and a huge one swooped into an above tree and sat there. It was brown, with a light underbelly. And large. Much bigger than a crow. Great to have a Goddess post a comment — many thanks! Hawks are dumb when they are very young. They don’t know danger and seem to have no fear. So they come close to people. I hope we get some more juveniles in our back yard this year — it makes for great photo ops! My grandson (grown grandson, that is) and I had an exciting bird episode yesterday. Looking out our back window, I saw a flurry of BIG wings. Went over to it, and there was a Cooper’s Hawk clinging to the windowsill. On the ground beneath it was another one, over and over pulling with its beak at the landscaping cloth in the flower bed beneath the window. It never managed to tear the cloth, and I wonder what it would have done with it if it had. Today they are both here again and have perched for ages (so I can get a great look) in the branches of a tree. No birds were at the feeders–not surprising, but there was a little squirrel on the ground. One of the hawks swooped down and over to it, but it was fast and got away on a railing. I think the hawk didn’t have very good aim! We had the same experience with Hawks nesting in our neighborhood, last summer (2008). You can read all about it on my blog. I have seen them swoop down across our yard at dusk, this summer but no sign of nesting. They probably could not live in the same area for too long for obvious reasons. I am glad the doves are back, visiting my bird bath! 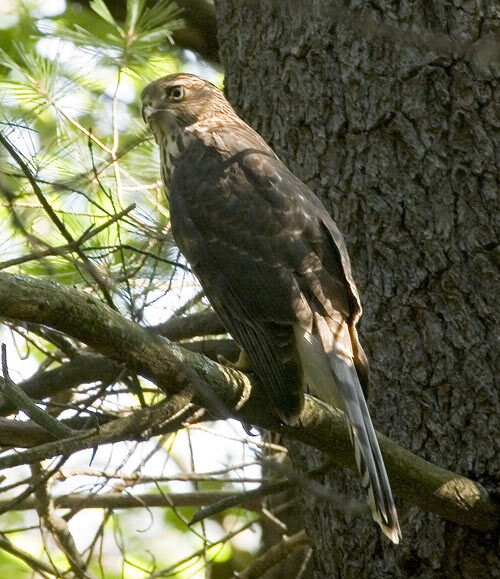 My family and I have seen a bird that looks like a Hawk in our yard or could be a falcon looks more like a hawk. Were from a small town in Southern Illinois, it was so amazing to see. Hi Frank – beautiful photo! We have at least one Cooper’s hawk that visits our backyard – I do feed the smaller birds – that is what draws them. We live in Nebraska – on the outskirts of town – we do have large redtails we see often on roofs & fields nearby & soaring overhead. This morning I saw something amazing – the extremely large Cooper’s was sitting in a tree while a jay & smaller birds were hiding in a large thick bush. There was a squirrel in a tree scolding the hawk. The squirrel climbed down, ran to the Cooper’s tree & began to climb toward the bird (that was about 3x the size of the squirrel!) It had no fear! When it was about 2 feet away from the hawk – the squirrel leaped towards it!! That finally made the Cooper’s fly away – but only to a tree in the next yard. The squirrel began foraging for whatever it had hidden in the middle of our backyard – I was scared to death that the hawk would get it – the Cooper’s did swoop down on the squirrel but just “buzzed” it and made no attempt to pick it up. (whew!) That would have been awful. thanks for sharing your photo.